Mixture is a famous snack of South India. It is easy to prepare mixture at home. Nothing can beat the taste of home made mixture. 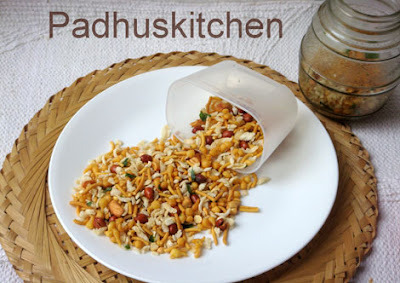 I have already published detailed post on How to make Kara Boondi and Omapodi. If you know how to prepare kara boondi and omapodi, then preparing South Indian mixture at home is no big deal. Prepare Omapodi (sev), crush it and keep it aside. Kindly refer my detailed post with pictures on how to make Omapodi. Heat oil and fry pottu kadalai ( fried gram) and keep it aside. Then fry aval and drain it on a paper towel to remove excess oil. Then fry peanuts, cashew nuts and curry leaves separately. Now mix everything together and sprinkle a little salt and chilli powder on it. Mix well again. There are no hard and fast rules regarding measurements though I have given it approximately. If you like boondi more, you can add more of that. Likewise if you like omapodi (sev),then you can add that more. Enjoy it as such or with a hot cup of tea or coffee. Do not forget to check out my lovely collection of Diwali Snacks and Sweet Recipes. Gr8 recipe........!!!! This mixture is very famous even in Orissa where ppl fondly call it Madrasi mixture!!! I love it ... once you start eating..no way you can stop.. This is my all time favorite. I have located a place in Noida, where I can get the southern mixtures. I have a good mind to make it, if not the mix but the Omapodi for sure. crunchy and great munch with a hot cup of tea. looks very good. Feel like munching some,my fav mixture.. I love this. wonderfully prepared. Perfect with a cup of tea..looks great! Always wanted to make it, will try this one out..